On a business trip it is essential to implement everything that’s been planned, without wasting too much time in search of the key services. At the Golden Ring we perfectly know the value of time of our travellers and always strive to offer maximum of convenient and efficient services right on-site. In a situation when it is necessary to hold negotiations or a number of business meetings, but there is no possibility to search for a suitable location or to spend time traveling around the city, the ideal solution is to book our new boardroom directly via Reception desk. 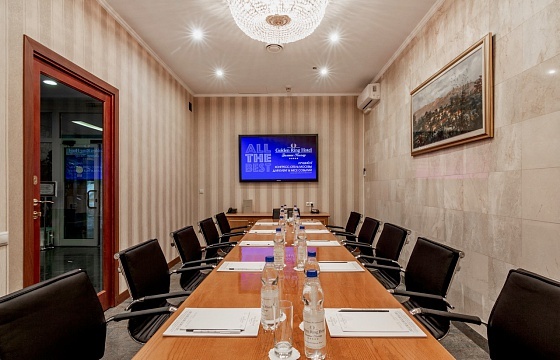 Murom boardroom is located in the lobby, next to a magnificent fountain and a 24-hour lobby bar. This venue accommodates up to 12 guests, is equipped with a 60-inch plasma screen, AC, light control system, mobile charger doc, telephone. Any additional amount of equipment is provided at guest request: from a flip-chart to a conference system. All resident guests are welcome to book this brand new boardroom for their convenience at exclusively low rate. Loyalty program privileges are as well applicable to this procedure.